At $349 off contract, the Nexus 5 has always been one of the best bang-for-your-buck smartphones on the market. In order to keep the price that low, however, Google had to pass up on some of the minor features that other flagship phones offer. Stereo sound, for instance, is becoming a staple in many top-of-the-line phones. The Nexus 5 simply does not support this feature out of the box, with its single speaker hardware making that functionality nearly impossible. Nearly. Developer Sasha Shafranko has found a rather inventive way around this limitation. By routing audio through the front-facing earpiece on your Nexus 5 in addition to the existing bottom speaker, you can now enjoy true stereo sound with all of your music and media. Shafranko's stereo sound mod comes in the form of a flashable ZIP file. To download this file, point your Nexus 5's web browser to this link, then wait until the download has finished before proceeding to the next step. Next, power your phone completely off. When the screen goes black, press and hold the volume down and power buttons simultaneously. This will bring up Android's bootloader menu—from here, tap the volume down button twice to highlight "Recovery mode," then press the power button to select it. 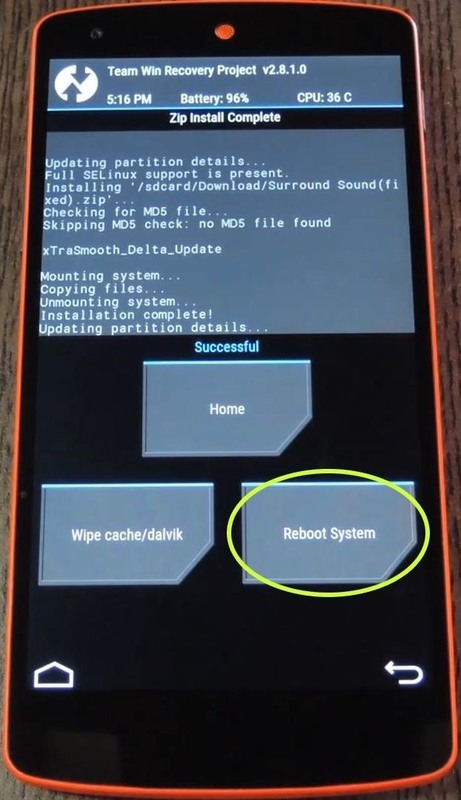 For an easier way to boot into custom recovery, check out my guide on adding a full reboot menu to Lollipop. 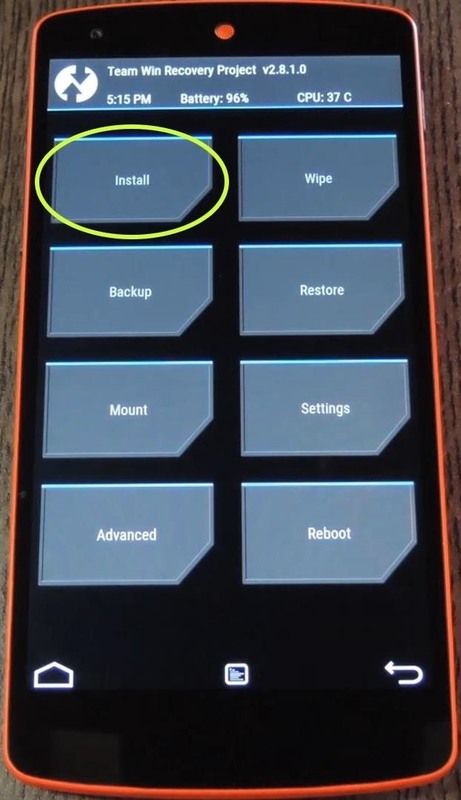 From TWRP's main menu, tap the "Install" button to begin (this may be slightly different if you're using ClockworkMod, but the general process is very similar). 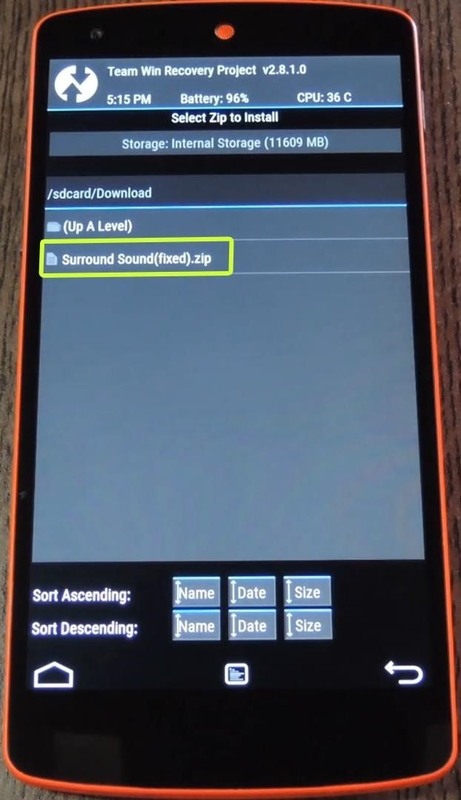 From here, navigate to your device's Download folder and select the "Surround Sound(fixed).zip" file. After that, simply swipe the slider at the bottom of the screen to install the mod. When the process is finished, tap "Reboot System." When you get back up, sound will be played through your front-facing earpiece and the bottom-firing speaker simultaneously. This goes for all media, so crank up the volume and enjoy the show. 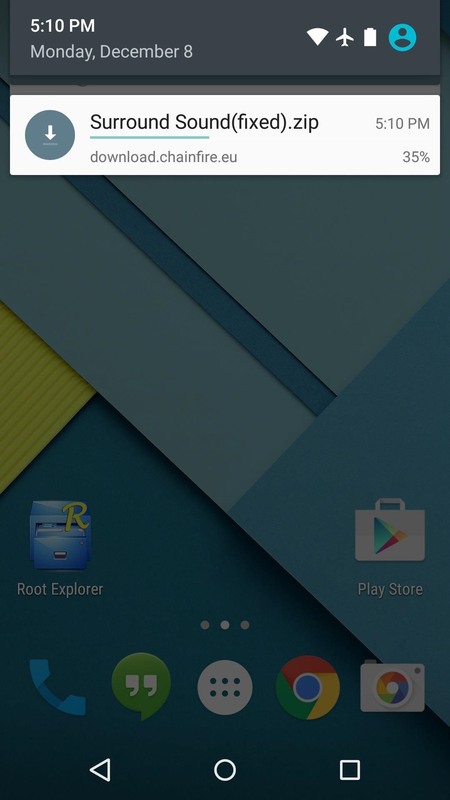 If you'd like to disable this functionality, a revert ZIP is available here. Just flash the file in custom recovery using the same method depicted above. I'm loving the improved sound quality that this little mod brings, how about you? Let us know in the comment section below, or drop us a line on our Twitter or Facebook feeds. 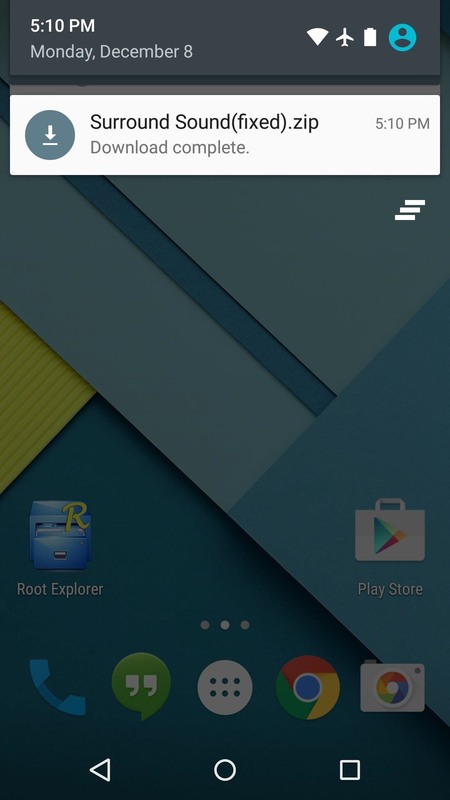 I just Flashed the zip file on Nexus 5 running Lollipop and trust me, it works flawlessly! Although the earpiece speaker is not as good as the bottom one, it just manages to produce the stereo effect for the songs being played! To be honest, the earpiece produces a muffled output but can't blame the mod for that, Google has designed Nexus 5 such that it produces a muffled voice. My suggestion to others, just go ahead and flash the zip. Hope you like it and thanks for such a wonderful MOD Dallas Thomas! My fear is that speaker will not destory. I've been using this for the last week now and the speaker seems to be holding up just fine. It's not really getting maxed out by this mod, so there's not much distortion even with the volume all the way up. But you don't really need the volume turned all the way up with this mod on—it puts out much louder sound overall, so you can keep it at like 75% if you're concerned, and it will still be louder than it used to be. Hopefully not a dumb question lol, but this will only work on the Nexus 5 right? 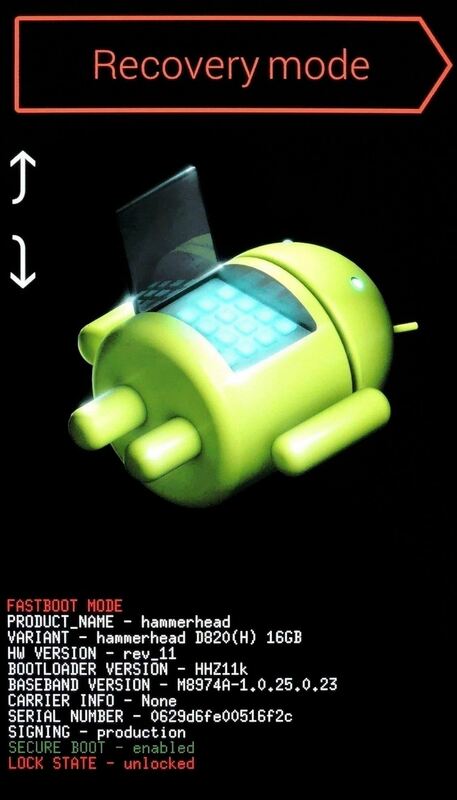 or will it work on other nexus devices as well as other devices such as a zte source for example? Thanks! I only have an older nexus S4g to try it on not sure if it'll work. I really wouldn't recommend trying this with any other device. The flashable ZIP writes a new mixer_paths.xml file to the root partition of the device, and this file has several device-specific values inside of it that probably won't work right on anything but the Nexus 5. It works like a charm, thanks, such a wonderful mod! The Nexus 5 Real Volume Booster app changes some values in the mixer_paths.xml file, which is the same file that this ZIP modifies. That said, if you install this ZIP after making changes to the overall volume with the N5RVB app, this would simply overwrite those changes. So you could give this a try and you wouldn't be affected by the previous mod, then if you found it too loud or too low, you could still use N5RVB to increase or decrease the bottom speaker's output. Can i undo the mod? I've been using it on my Nexus 5 for 4 months now, and neither the speaker nor the battery life have had any issues. There's a revert ZIP available at the end of the article, so if you want to undo the mod, just flash that in custom recovery.